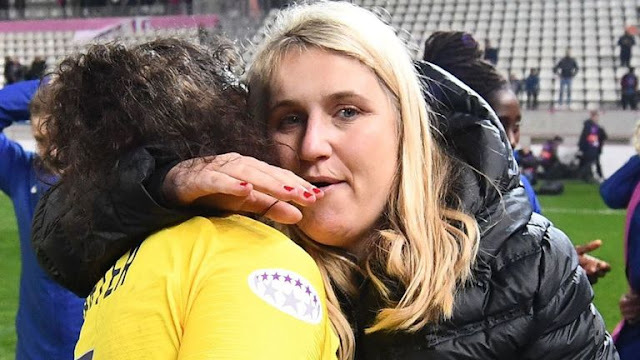 Emma Hayes says the atmosphere generated by the PSG Ultras spurred her Chelsea Women side on to victory as they booked their place in the Champions League semi-finals with a dramatic 3-2 aggregate win at the Stade Jean Bouin. Hayes' team were outclassed by the home side, who scored twice to wipe out their two-goal first leg deficit before Maren Mjelde grabbed a dramatic late goal to send Chelsea into the last four . Despite fears over crowd trouble after incidents in London last week, Hayes said she revelled in the atmosphere generated by a loud section of the five-figure crowd. Hayes said: "I loved it - I was humming the songs as the game went on. "It adds to the sport when we're playing in front of crowds like that and I can only encourage and congratulate PSG for that because it certainly gave them a home advantage." Despite being disappointed with her side's general performance, Hayes said she never doubted their ability to turn the tie on its head and seal a place in the last four. "I was a little disappointed with my team in terms of how we managed the game and I had to work hard as a coach to keep us in the game at times," she added. "But I have a united group and a spirited group that fight their way through adversity and we held on through many difficult moments to stay in the game. "I felt during the last five minutes that we wanted a winner - I could sense it in them, so when Karen Carney dropped it in that space I knew there was only going to be one outcome."